Our meal at Blue Water was mighty delicious and we did have a fair amount of food yet we didn't quite feel satiated probably due to not eating lunch that day. A few days prior we had watched a local special which had a section on El Indio, alleged creator of the taquito in the early 40's after demand from customers for a quick take away lunch. As it happens, we actually pass by this place often but never thought to give it a run. Being a block away and still in search of sustenance we decided to try their taquitos. It was around 7ish when we walked into an incredibly packed El Indio . I had never seen a Mexican joint so brimming with people. Though pleasantly surprised I felt confident about the food. 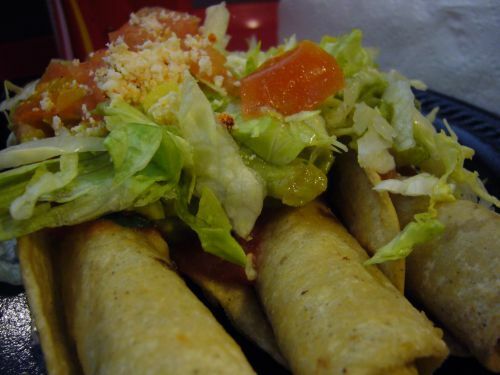 We ordered three taquito specials- a taquito with cheese and guacamole. I was thus gleeful when I bit into one of these- greeted with a freshly fried crunch shell stuffed with moist shredded beef. Though the actual taquito was great, I think the serving of cheese and guacamole are on the scant side. I also thought the salsa bar was quite small as well. I do recommend not coming at a peak hour for some more elbow room. Hmm I shall give 'em a try then. I found some coupons in this little book that came in the mail but never felt like having Mexican for dinner. Good taquitos huh? I'll take you word for it! clayfu + food= clayfood recently wrote a not so positive review on this place. I only tried the taquito that day and happened to have a tasty one. I'd suggest that you just try it and form your own opinion on it. Look forward to reading your reviews.